As you may have heard,The New Yorker’s Architect Critic, Paul Goldberger, is leaving for Vanity Fair. But, after years of “fighting for adequate space” in an increasingly shrinking column, Goldberger won’t be finishing his writing days as Architect Critic of The New Yorker, but as Contributing Editor of Vanity Fair. I too will add a cry to the din: “The Architecture Critic is Dead!” But you know what? Good riddance. Because criticism hasn’t died the way you think. It’s just been changed beyond recognition. And frankly, for the better. So what does this mean for the critic? It means that he or she must transform too. It means moving beyond the description of the building as “object” and delving into its context; it means talking to the people who live down the block; discovering how the average man perceives it; determining the extent to which it serves humanity. It means the critic must be a reporter. And an activist one at that. When Michael Kimmelman took over in September 2011 as Architect Critic at The Times, the response was … pessimistic. Kimmelman sets us up beautifully. From the beginning we viscerally understand the problem : the human beings in Penn Station aren’t passers-by reveling in their environment, but humiliated commuters crawling through a dank, urban underbelly. More than making the experience understandable, more than explaining how the architecture has completely failed its purpose and degraded the human spirit, Kimmelman does something much more important here – he offers a practical solution. 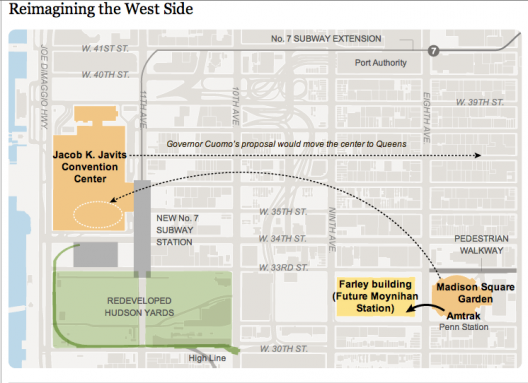 He suggests moving Madison Square Garden to where the Jacob K. Javits Convention Center currently sits, giving the Garden a coveted riverfront location and New York’s commuters the space for the lighter, ennobling Penn Station they need. 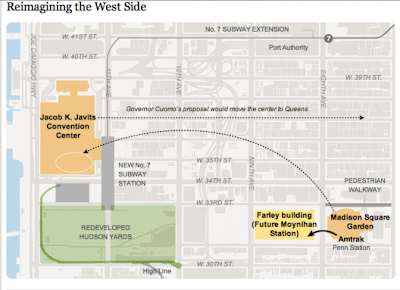 In his piece on the NYU: 2031 Expansion plans, he suggests letting NYU build their large multi-purpose tower, the Zipper, but also suggests where you could create a park to provide the green, public spaces that the inhabitants of Grenwich Village lack. This is what makes a great Kimmelman article great – not just his ability to connect to us, but to suggest the compromises that will instigate debate and conversation, to offer solutions that inspire us to improve our cities for all. While the archetype Architect Critic, as we knew him, was stodgy, “starchitect”-obsessed, and content to let his prose be as impenetrable as possible, he was at least a filter. He determined what was worthy of discussion, what we should be talking about. And while the boom of design blogs and architectural web sites (this one included) lets us know that Architecture has not ceased to be relevant – on the contrary, it has become far more central to our daily lives – the lack of a critical voice means that we have compromised discernment for speed, quality for quantity. Since Architecture is alive, well, and thriving, I believe this is the key to Goldberger’s declining influence (almost perfectly timed with Kimmelman’s rise) and eventual deposition. As sensitive as he was to the sea changes in architecture (he sees the critic as social advocate), for many, he still represents the old. His reputation has been set as the Architecture Critic par excellence – which in today’s world is a bad bad thing. I would hazard a guess that Remnick will follow in The Time’s footsteps and hire a Kimmelman-eque Reporter, ears alert to the newest ideas/issues, ready to relate them to architectural solutions. And, while he may not have a column to call his own, it will be to his advantage. Because he won’t be restricted to the Arts section. He will be anywhere at all – perhaps News, Culture, even the Front Page- because his topic is expansive and never-ending: how design can better our world. The “critic” may be dead, but the conversation is only just beginning. Arieff, Allison. “Why Don’t We Read About Architecture?” The New York Times Opinion Pages. March 2, 2012. Brake, Alan G. “BREAKING: GOLDBERGER DEPARTING NEW YORKER, BOUND FOR VANITY FAIR” The Architects’ Newspaper Blog. Chaban, Matt. “T-Squared Off: With Paul Goldberger Leaving for Vanity Fair, Is This the End of Architecture Criticism at The New Yorker?” The New York Observer. April 2, 2012. Goldberger, Paul. “Writing About Architectue.” Lecture to Yale School of Architecture. October 8, 2007. Jose, Katherine. “How ‘The New York Times’ controls architecture criticism in America, whoever its critic may be.” Capital New York. March 1, 2012. Kimmelman, Michael. “Restore A Gateway to Dignity.” The New York Times. Lange, Alexandra. “How to be an Architecture Critic.” The Design Observer Group. March 1, 2012. .
Lange, Alexandra. “Why Nicolai Ouroussoff Is Not Good Enough.” The Design Observer Group. February 18, 2010. .
Liu, Jonathan. “Times Art Critic Michael Kimmelman to Take Over as Paper’s Architecture Critic.” The New York Observer. August 9, 2011. .
Rao, Mallika. “Paul Goldberger Moves To Vanity Fair, Eulogies For Architecture Criticism Not Far Behind”The Huffington Post. Rybczynski, Witold. “The Death of Criticism.” Witold Rybczynski.com. Quirk , Vanessa . "The Architect Critic Is Dead (just not for the reason you think)" 06 Apr 2012. ArchDaily. Accessed 06 Apr 2012.